Cancellations must be made 24 hours in advance by email. If you do not show or you go with another guide, your credit card will be charged. Boats reservations are held by credit card number. Full payment (cash or charge) is due upon arrival as well as a $500 CASH damage deposit. All cancellations must be made in writing by email. Cancellations made within 48 hours will be charged one day of rental fee to the credit card on file. No refunds will be given for not starting the rental on the day of the confirmed reservation or for returning the boat back earlier than originally booked. The Damage Deposit will be returned at the end of the rental, provided the boat is returned at the agreed upon time and in the same condition when it was received. If the boat is reserved on the day you arrive, it will be held the entire day, giving you flexibility on your schedule. One day is considered 9 am to 1 hour before sunset, not 24 hours. Please provide us with arrival information and where you are staying so we can facilitate your rental after arrival. If you have booked a golf cart with us,we do our best to deliver it to the airport for your arrival. All boats are kept at Serenity Dock at night unless another mooring has been agreed upon. If you have rented a golf cart, you come to Serenity for your boat and return it to Serenity Dock at the end of the day. If you do not have transportation, we will make arrangements for picking you up and returning you to your accommodation or the airport at the end of the day. On the first day of your rental, we will go over the contract, collect payment/damage deposit,, and thoroughly check you out on the boat. Fuel and oil is not included, so you are responsible for returning the boat full of fuel. The Staniel Cay Yacht Club fuel dock closes at 5 pm every day. If you do not fuel the boat, there will be a $25 charge added to the price of fuel and oil, which will be collected from your cash deposit. There are times when the yacht club runs out of fuel without notice. If fuel is not available after your initial tank, you are still responsible for fuel during your rental. We will make every effort to help you in this situation, however conservation is recommended. To book an accommodation, 50% of the rental fee along with the security deposit is due within one week after invoice is emailed. Once the deposit is made, we will confirm by email that it is in the account. The balance of the rental fee is due 30 days prior to arrival. If the balance is not received by the due date, you are at risk of losing your reservation. NOTE: All accommodations are private homes, so please treat as you would your own home. If excessive cleaning is necessary (including dirty dishes in the sink), $100 will be deducted from your security deposit. Any credit issued for any reason must be used within one calendar year from date of issue. PLEASE NOTE: The island may experience outages of electric, water, phones and internet. We will try keep guests informed if any of these services go down. Dockage is paid upon booking and cancellation is the same as accommodations. If electric is pre-paid and there is a cancellation, that portion will be refunded. If guests arrive on a morning flight, they can go to the yacht club for breakfast and then explore in their cart until the accommodation is ready. Those departing on an afternoon flight can book a golf cart an extra day and have it to go to lunch at the yacht club, leaving the cart at the airport. Luggage can be stored at the accommodation. As of July 1, 2018, a Value Added Tax of 12% will be added to all goods and services in The Bahamas. Please note, not all businesses are required to be compliant. 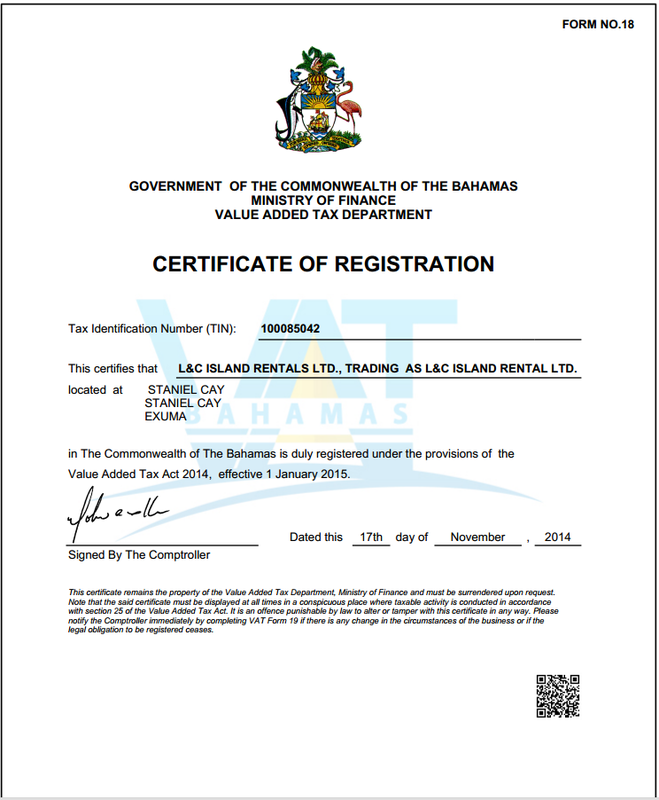 If the Certificate of Registration is not posted, you should not be paying VAT.